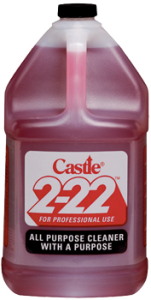 Castle® 2-22 Red™ is an industrial strength, VOC compliant, low foam cleaner and degreaser that is water soluble and non-butyl. 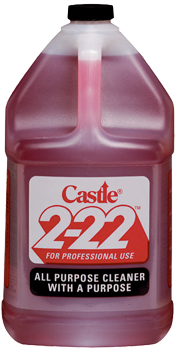 When cut 32 to 1, 2-22 Red™ is still a strong cleaner with a pH of 10. 2-22 Red™ is strong enough to degrease a machine and gentle enough to clean a carpet. It is truly an “All Purpose Cleaner”. 1. For Hard Surfaces:Can be used full strength or cut 32 to 1, depending on the degree of soil to be cleaned. 2. For Rugs, Upholstery, and Cloth Surfaces:Pour 1 quart concentrate into a clean 5 gallon bucket, direct a strong spray of water into the bucket to develop mounds of suds (about 3 gallons of water, with a brush, apply suds to surface to be cleaned, brush in a circular motion, and wipe dry with a clean cloth. 3. CAUTION: Not safe for use on glass.